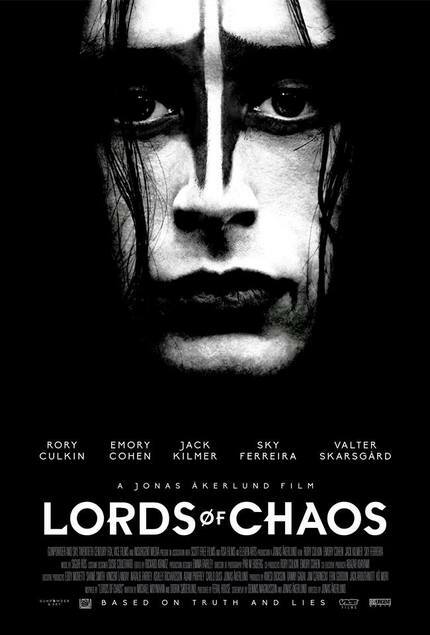 A film nearly a decade in the making, Jonas Åkerlund's Lords of Chaos is finally set to hit theaters in North America on February 8th from indie distributor Gunpowder & Sky. To promote their new film, the first domestic trailer for the film dropped today and it does an amazingly good job of conveying the really weird tonal dissonance of the film which enjoyed a healthy festival run in 2018. Lords of Chaos is based on the 1997 non-fiction book by Michael Moynihan, which detailed the rise and fall of Norwegian Black Metal and in particular the bloody chaos that followed the band Mayhem and some of its founding members. The film stars Rory Culkin as Euronymous, the founder of Mayhem, along with a strong supporting performance from Emory Cohen as Varg Vikernes, the man who would come along and eventually burn it all to the ground. Noel Lawrence saw the film upon its world premiere at Sundance last year and said, "this pic will please metal fans and outsiders alike," and I tend to agree. It's a weird one in terms of shifting tones, but it comes together in a very entertaining and satisfying way. Check out this trailer that does a pretty great job of representing the tragicomic vibe of Lords of Chaos without giving away too much of the action.